A spectacular visit to the most active volcano of the Nicaraguan mountain ranges. 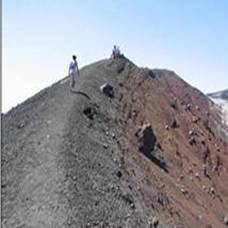 You will have the opportunity to climb the volcano and see the incomparable craters of this impressive, majestic, and violent colossus. You will also have the opportunity to appreciate the view of the very close mountain range. With this excursion you will have the opportunity to get to know what ealier used to be the beautiful original city of Leon. You will also have the chance to appreciate beautiful landscapes like the Xolotlan Lake and the Momotombo and Momotombito Volcanoes. A place of impressive natural beauty of craterous origin, immersed in the very interesting Maribios mountain range and suitable for fishing. You can refresh yourself and swim in its 100% natural and clear waters. Under the administration of Chinandega, it is one of the most important ports in Nicaragua, where ships are arriving from all over the world. 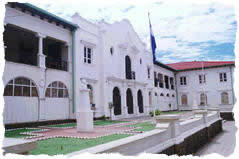 It is also the site where the main products of the country are exported like rum, sugar, coffee, etc. You can also enjoy a nice swim from its beautiful beaches. It is located in the northeast part of the country, and is blessed with a refreshing mountain climate. Its inhabitants call it the “pearl of the North”. During this excursion you will have the opportunity to appreciate the Maribios mountain range, mountain landscapes, and a variety of handicrafts available beside the road throughout its course. 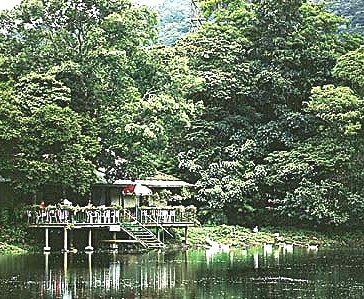 This is located on the road from Matagalpa to Jinotega. It is a very welcoming area, with a moderately cold climate and spectacular views in the forest and of the adjoining hills of the area. From here you can walk through the virgin mountains which surround it and during this walk you will see all sorts of forest animals. 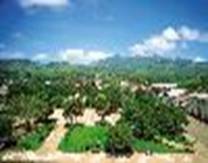 This city is in the north of the country, and has a refreshing and agreeable climate. 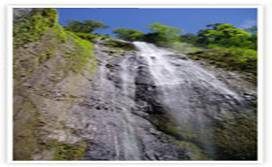 Here you will get to know the traditions and customs of its inhabitants and see attractive areas such as the Estanzuela waterfall and other interesting sites. You will also have the opportunity to learn about tobacco processing as tobacco is one the principal crops in this area. We will tour the most important places in Leon to get to know the social and cultural infrastructure as well as the Colonial architecture of our beautiful university city. You will also appreciate the many artistic murals with their wide and varied social/political content, part of our historical heritage. 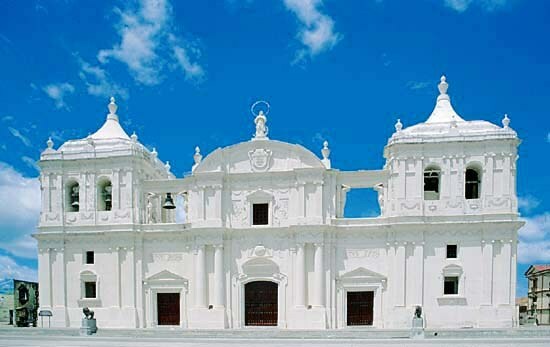 Visit to the Metropolitana Cathedral: This is an impressive site where you will be able to study many paintings and sculptures of plaster, marble, and wood. 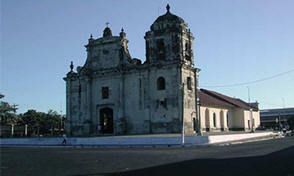 This colonial cathedral is in the Neo-Classical Baroque style. Tour of the basements and rooftops of the Cathedral: This is an incredible view where you can see the majestic architectural construction of our Real Basilica Catedral Metropolitana, as well as, from the rooftops, the beautiful coastal mountain range. Tour of Leon’s universities: You will have the opportunity to get to know the university life here in Leon, visiting the different campuses, speaking with students and university personnel, and learning what different careers are taught here in Nicaragua. Artistic Night: A cultural presentation of different folk dances in the typical native and colonial dress, as well as Latin dances, such as Merengue, and the folk dances of the Atlantic Coast, such as the “Palo de Mayo”. 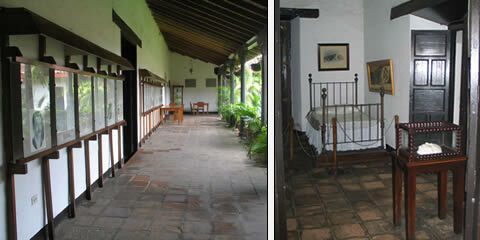 Ruben Dario Museum and Archives: This museum contains all the details and secrets of the great modern poet that revolutionized the Spanish language, for which he is known as the founder of Spanish letters and is universally recognized and acclaimed. 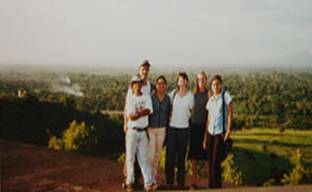 Leon’s Center for Environmental Initiatives (CIMAC): At this botanical garden you will learn the four vegetation groupings representative of Nicaragua (savannna, wet, shoreline, and dry) and enjoy a fruit orchard. You can see flowers throughout the year, as well as see and hear birds and animals. 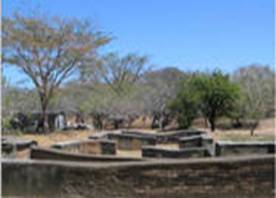 The Fort Lookout: This historical fort is located on a hill called Acosasco and is ideal to watch over the city. 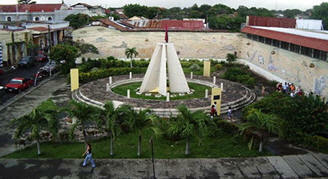 During the Somoza years it was used as a jail where they tortured political prisoners. Actually from this lookout one can comtemplate beautiful landscapes, such as the city itself and the surrounding mountains. 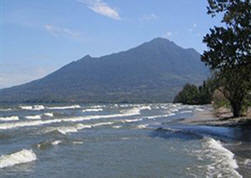 Poneloya Beach: A beautiful spot with a wide, clean beach, where you are able to fish and swim. Las Penitas Beach: The most beautiful beach of Leon, where you can enjoy the sunshine, walk along the coast, and see an amazing sunset. You will enjoy this activity. Stroll through Sutiava’s neighborhoods: A short walk to get to know the native people, the Sutiavas or Maribios, that even today predominate in Leon. 2019 © Metropolis Spanish School - León, Nicaragua. All rights reserved.